A Fourth of July Giveaway! Happy Independence Day! Are you doing anything special with your family? I’m currently in New York visiting mine. Every year we do a big holiday BBQ, which includes something accidentally getting lit on fire. This year we aren’t having our firecracker-fueled bash because we are getting ready for my cousin’s wedding tomorrow. While we get everything prepped, I wanted to celebrate with you by doing this food truck inspired giveaway! I love food trucks. I have driven hours out of the way on road trips so I could try ones out that I saw on TV. 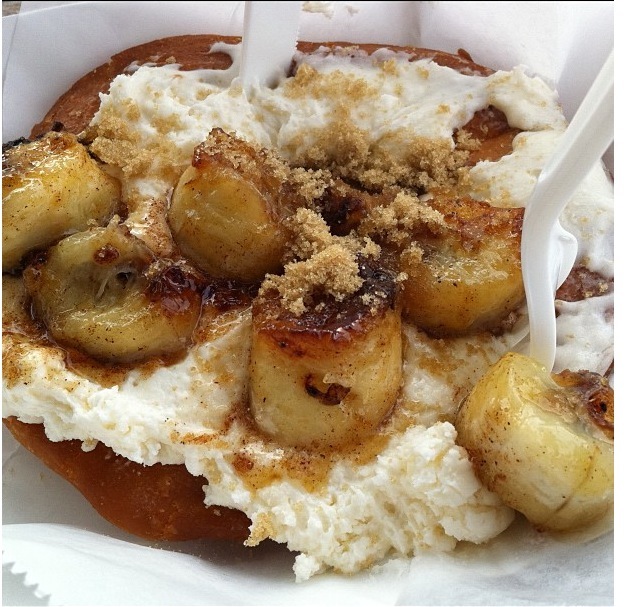 My first time I ever visited Austin, Texas, my first stop was a donut truck called Gourdough’s. I had dessert for dinner that night, and it was 100% worth it. I mean, look at it. How can you pass that up? My last semester of college a grilled cheese food truck started parking outside the building where I had my first class. The truck, Lee’s Grilled Cheese, served this incredible Tomato Basil Grilled Cheese that I started ordering once a week without shame. When the food truck cancelled its permit with my school and moved hours away to a food park, I went to visit it there. Seriously. I love food trucks that much. Of course, my favorite all-time food truck is not a truck at all. It is a cart…or many carts located in NYC — the Sabrett hot dog cart. My family and friends in New York refer to these as “Dirty Water Dogs”, but have no fear. Sabrett hot dogs are delicious. I am not even that big of a hot dog fan, but slather one up in some authentic onion sauce and I am sold. When I found out the onion sauce is now sold at World Market, I decided it was time to share the magic with you guys. This food truck inspired giveaway includes three items. 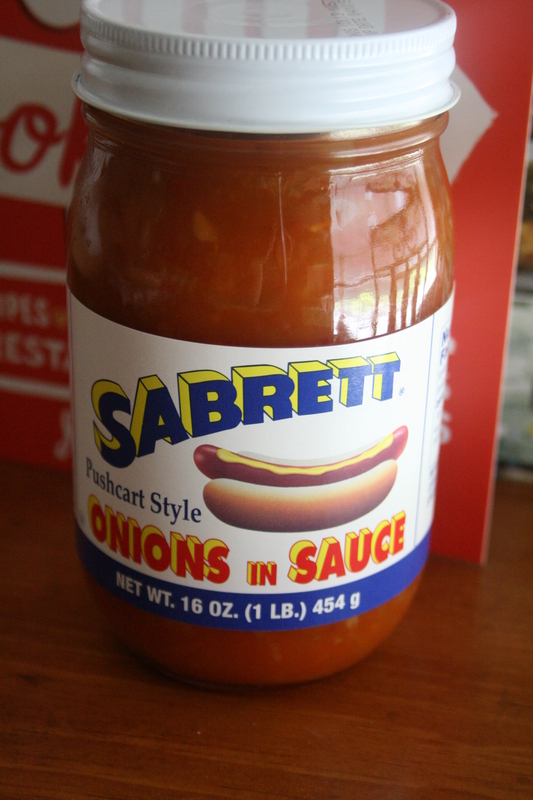 You will get a jar of Sabrett onion sauce and a container of the company’s spicy brown mustard. 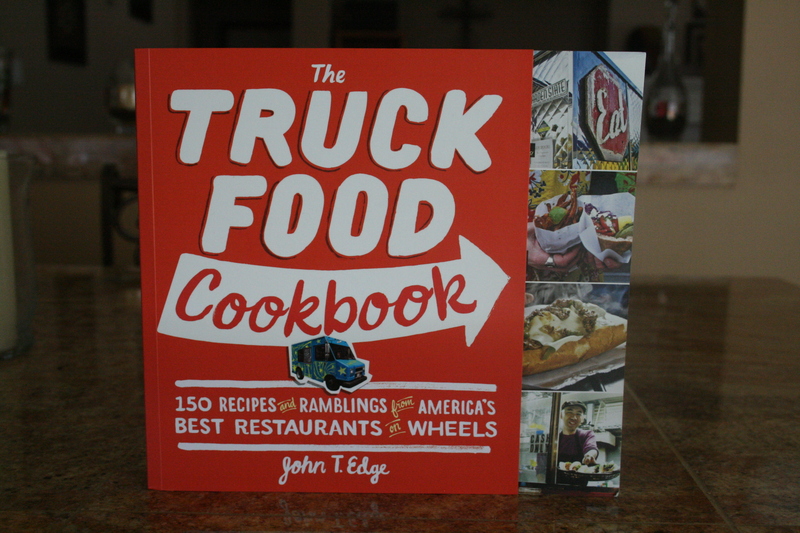 In addition, you will also get a copy of The Truck Food Cookbook from World Market. It is filled with tons of variations on the hot dog, as well as tons of other food truck recipes from real trucks around the US. This cookbook came out only for the season and is already disappearing out of stores — I couldn’t find it when I went to pick up the copy — so if you don’t enter this giveaway you may never get the chance to see this gorgeous book! 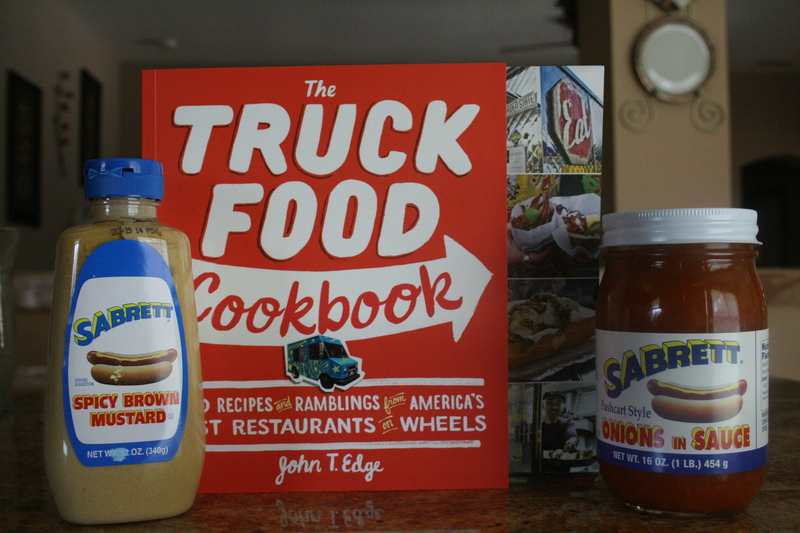 This entry was posted in Giveaways and tagged cookbook, food truck, giveaway, hot dog, recipe. Bookmark the permalink. 1 Response to A Fourth of July Giveaway!